Spread across five different buildings. What happens when a home brand that virtually defines luxury meets a historic masonry building in the heart of Napa Valley? 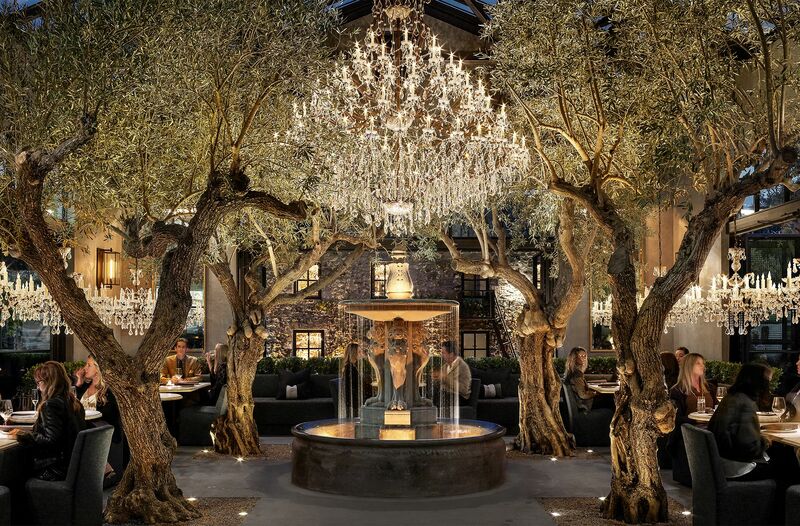 According to Restoration Hardware, a “one-of-a-kind food, wine, art, and design experience” in the form of its brand-new Yountville compound. Yes, that’s right: The upscale interior brand has created a unique experience in California wine country that involves furniture shopping, professional design services, a seasonal menu, and, of course, wine-tastings. A landmark structure built in 1904 has been redesigned into a “ma(i)sonry” building, where visitors can sip Napa Valley wines made by small-scale producers. In addition, two boutique design galleries showcase globally sourced antiques and RH furnishings. Installations of RH-curated interiors arranged by top interior designers are also spread across the five-building property. Through it all, immense chandeliers cast warm light in the largely neutral-paletted spaces, which are complete with natural wood and marble textures. Most magnificent of all, however, is the outdoor space, complete with heritage olive trees, cascading canopies, and artfully landscaped topiaries, amid which you can enjoy a menu of fresh, elevated dishes by chef Brendan Sodikoff. If this sounds like your ideal Napa Valley escape, make a reservation to eat, drink, and plan your living room redecoration before the hot spot books out.